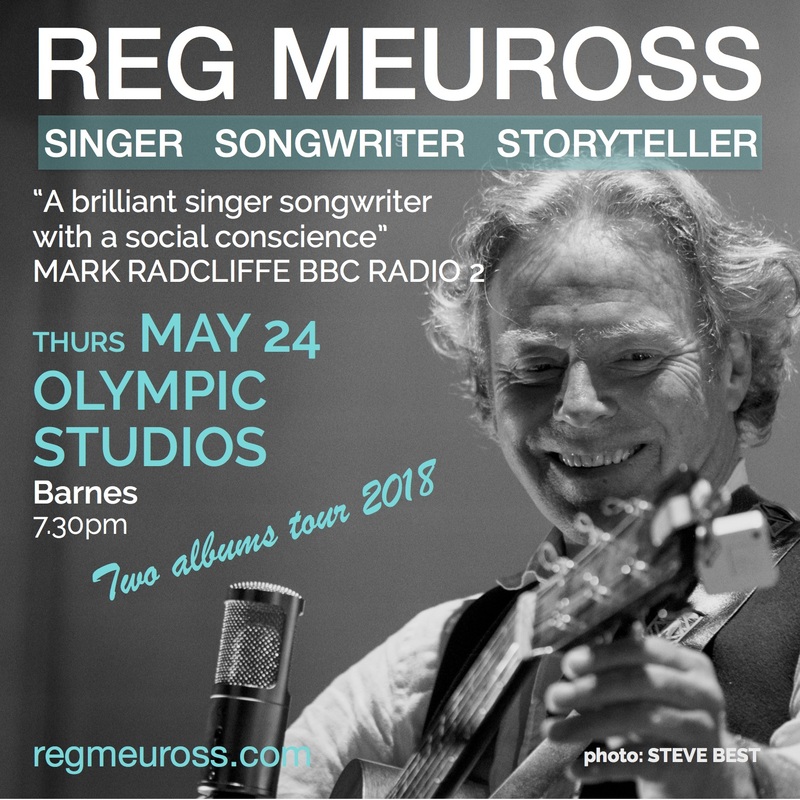 “A brilliant songwriter and true modern troubadour with a social conscience”said Mark Radcliffe when Reg Meuross played live on the BBC Radio 2 Folk Show earlier this year. The Somerset based singer-songwriter who has performed at the Albert Hall and has been playing acoustic and folk clubs the length and breadth of England, Scotland and Wales, as well as delighting audiences around the world, for over 30 years now seems, finally, to be getting some of the recognition he deserves. The prolific Meuross has been touring the length and breadth of the UK with a ‘Two Album Tour’ with both hard hitting ‘Faraway People’ which turns a much needed spotlight on pressing social issues such as austerity measures and refugees, plus a stunning compilation ‘Songs About A Train.’ He has also found time to write and perform a song cycle, ’12 Silk Handkerchiefs,’ about Hull’s ‘triple trawler tragedy’ of 1968 which he researched with the author of the book ‘Headscarf Revolutionaries’ Dr Brian Lavery, who narrates the show which has so far been performed once live in Hull with local musician Sam Martyn. But listen to Reg Meuross and you will soon realise it’s not all protest, he has penned some of the most beautifully disarming love songs and lyrics ever written. Reg Meuross first emerged onto the acoustic music scene in the 1980s with The fast paced duo Panic Brothers, before forming the band The Flamingos which featured ex Graham Parker guitarist Martin Belmont, Bob Loveday from The Penguin Cafe Orchestra & Bob Geldof’s Band & Alison Jones of The Barely Works. They recorded one album called ‘Arrested’. In 1996 Reg decided to go solo and has since released 11 highly acclaimed studio albums: The Goodbye Hat, Short Stories, Still, Dragonfly, All This Longing, The Dreamed And The Drowned, Leaves & Feathers, England Green & England Grey, December and Faraway People and Songs About A Train. The years of touring and playing solo as well as with many other acclaimed artists at art centres, music clubs and festivals the length and breadth of the UK as well as abroad and an award winning catalogue of albums, established his songs as “the hinges upon which swing the doors of perceptive English folk” (Folkwords). “echoes of early Dylan, Tom Paxton and Leonard Cohen.” The Guardian.